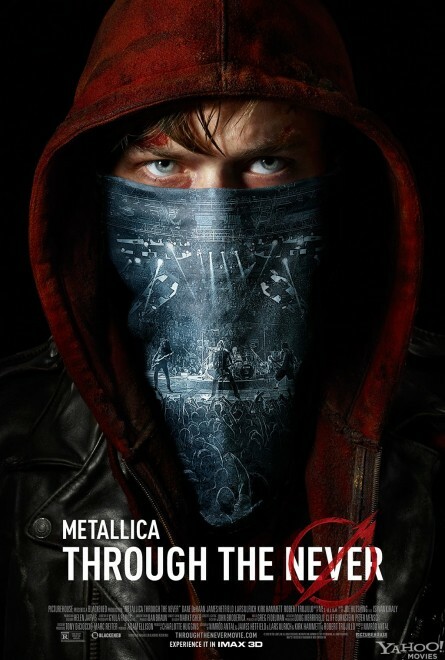 Metallica Through The Never directed by Nimród Antal stars Dane DeHaan (Chronicle, Amazing Spider-Man 2) and tells the story follows a young roadie (DeHaan) through a terrifying post-apocalyptic urban streetscape as Metallica delivers a roaring live set created exclusively for the film that mirrors the destruction and chaos of his journey. Keep reading to check out the trailer and poster. Award-winning filmmaker Nimród Antal (Predators, Kontroll) creates a groundbreaking 3-D motion picture event, Metallica Through the Never. The music-driven feature film combines a bold narrative and spectacular live-performance footage of one of the most popular and influential rock bands in history to produce a bracing, raw and visceral cinematic experience. 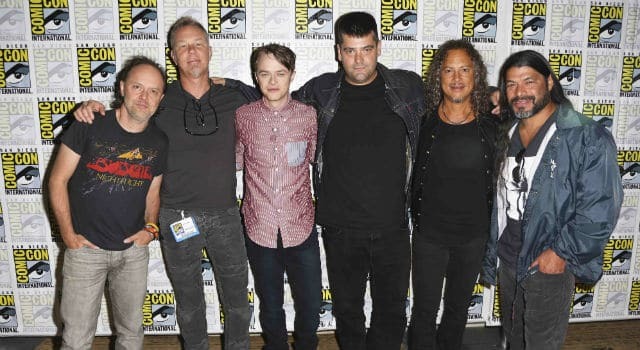 Emerging young star Dane DeHaan (The Place Beyond the Pines, Kill Your Darlings, The Amazing Spider-Man 2) portrays Trip, a young roadie sent on an urgent mission during Metallica’s roaring live set in front of a sold-out arena audience. As the band performs many of their most iconic songs for tens of thousands of devoted fans on a never-before-seen stage created exclusively for the film, Trip is dispatched outside the arena to meet a disabled delivery truck and recover a mysterious item being transported to the show. But the seemingly simple assignment turns into a surreal adventure when his car is hit by an out-of-control driver. Trip, dazed and bruised, climbs out of his van only to find himself pitched into the middle of a tense standoff between angry protesters and charging riot police. In the ensuing mayhem, a vicious masked horseman sets his murderous eye on Trip while delivering indiscriminate deathblows to rioters and cops alike. Fleeing through the desolate, post-apocalyptic urban streetscape, Trip has only his wits to protect him as he attempts to deliver the band’s precious cargo and avoid becoming the horseman’s next victim. Featuring dazzling pyrotechnics, the most elaborate live-performance stage ever built and imagery drawn from the band’s trailblazing iconography, the immersive 360-degree show creates a mind-bending, ear-shattering mirror image of the destruction and chaos of Trip’s journey. Metallica Through the Never’s state-of-the-art 3-D photography, captured using up to 24 cameras simultaneously, engulfs audiences in one of the most innovative and exciting cinematic experiences ever imagined. Metallica is James Hetfield (vocals, guitar), Lars Ulrich (drums), Kirk Hammett (guitar, background vocals) and Robert Trujillo (bass, background vocals). The band has sold over 110 million albums worldwide and was one of the top-ten grossing touring acts of 2012, generating $86.1 million in ticket sales from just 30 shows. Metallica Through The Never is written and directed by Nimród Antal and produced by Charlotte Huggins (Journey to the Center of the Earth). The film will be released by Picturehouse in North America onSeptember 27, 2013, exclusively in over 300 IMAX® 3-D theaters, and will expand into additional theaters on October 4, 2013.